This is one of the finest portraits of Robert Devereux, 2nd Earl of Essex, perhaps the most intriguing figure of the late Elizabethan period. By turns loyal, heroic, rash and treasonous, Essex’s career demonstrates the extremely precarious position of a ‘favourite’ at court under the Tudors. At one moment Essex was close enough to the queen to be regarded as her lover, but at the end she ordered him to be executed without qualms, apparently unconcerned that the job was so botched that it required three strokes of the axe. Essex was always destined to be highly placed at the Elizabethan court as a result of his close personal connection with the Queen: his mother, Lettice Knollys, was descended from Mary Boleyn, Anne’s sister. However, when Lettice married Robert Dudley, Earl of Leicester, in 1578, it became clear that Essex was to be especially marked out for preferment as one of Elizabeth I’s favourites. Leicester, keen for his stepson to assume the position of favourite at court, which he had himself long enjoyed, ensured that Essex was preferred in a number of important ways. Essex was appointed as commander of the cavalry in Leicester’s military mission to the Netherlands in 1586, in which he displayed great bravery, and he also succeeded Leicester as Master of the Horse in 1587. When Leicester died in 1588, having seen off with Essex’s help the rival advances of Sir Walter Raleigh for the Queen’s favour, it seemed that Essex was destined to become the leading courtier of the late Elizabethan period. However, Essex was even more headstrong than his stepfather, and even less prudent. He was also ultimately a less accomplished general, which proved to be his undoing. A failed campaign in 1591 against the French in Normandy, though not entirely his fault, led to the beginning of a period of gradual eclipse at court from 1592. Elizabeth’s continued willingness to entrust him with military commands still allowed him to pull off the occasional stellar success, such as the famous Raid of Cadiz in 1596. The most significant stage of Essex’s political and military career came in 1598 when he was appointed Lord Lieutenant of Ireland by Queen Elizabeth with the sole instruction of extinguishing the Irish Rebellion led by Hugh O’Neil, Earl of Tyrone (c.1550-1616) once and for all. The Nine Years War had been raging since 1595 and no English commander had been successful in suppressing the enemy. Essex, seeing the opportunity to regain his military prowess as well as the political advantages which it brought, therefore volunteered himself. Although experiencing success is securing Southern Ireland from possible Spanish invasion, Essex’s foolish confidence soon led to a number of disastrous decisions followed by a swift series of humiliating defeats, including a bloody ambush on Sir Conyer Clifford’s troops in the Curlew Mountains on 5th August. Despite this, Elizabeth I was still anxious to see Essex face Tyrone head-on in battle, and despite his apprehension about a lack of resources and men, he finally abided and marched north at the end of August 1599 only to agree a parley on the 7th September to the outrage of the Queen. The thoughts of political sabotage by his enemies back at home caused a hurried truce agreement and after dispersing his troops, Essex rushed back to London where he famously burst into the Queen’s chamber covered in mud and finding her in a state of undress. His final isolation at Court, his poverty and the flattery of his circle drove him to launch a futile rebellion in 1601, which, strangely, was encouraged by a special showing at The Globe theatre or Shakespeare’s ‘Richard II’. However, Essex’s abortive march into the City of London was quashed immediately, and he was executed for treason soon thereafter. The present work, recently discovered by Philip Mould & Company after conservation, is a half-length variant of Gheeraerts’ full-length portrait of c.1596 at Woburn Abbey, which differs in the clothing, collar and posture of the hands. The quality of the painting in areas such as the head, hands and details of the clothing, not to mention the extremely fine under-drawing visible under infra-red reflectography in the face, attest to Gheeraerts’ own extensive involvement in the picture. A slightly weaker version in the collection of Trinity College, Cambridge, in which Essex wears only black, is habitually published as by Gheeraerts in full. As in most Tudor portraits, however, there must always be room for an element of studio participation. The present composition, with a blue background, is repeated in an inferior portrait in the National Gallery of Art in Washington DC, the only difference being that Essex is holding a black hat. 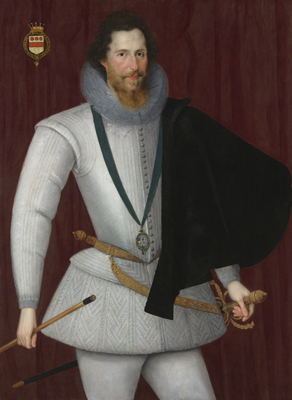 The portrait-type was commissioned following Essex’s victorious return from Cadiz and just prior to his self-inflicted downfall in Ireland (he holds in his right hand the baton of Lord Lieutenant of Ireland, surmounted with the royal crest). The Gheeraerts commission can thus be regarded as a method of displaying on a public stage his capabilities and superiority as a prominent courtier which no doubt helped justify his next appointment in Ireland. The choice of costume, with the white bodice and black riding cloak, are a clear allusion to Elizabeth I, whose colours were black and white. The pearl buttons and detailing may also allude to the purity of the Virgin Queen.